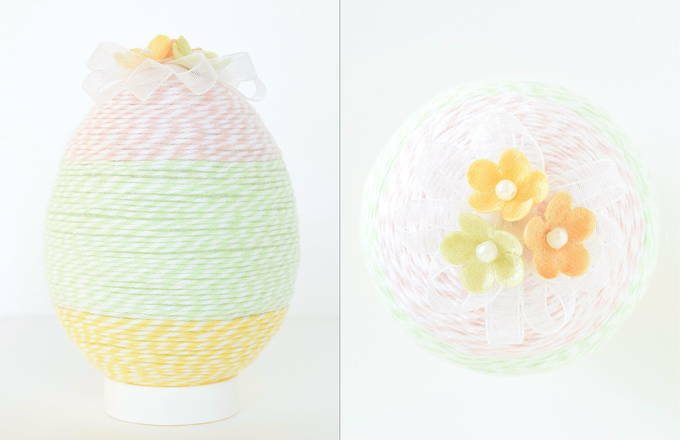 Put 2 rubber bands around the egg lengthwise to mark the top and bottom. The top and bottom rubber bands should look like perfect x’s. Put a pin at each x. Measure the distance from the x on the top to the x on the bottom. It should be 4-1/16 or 4-2/16”. If the distance down all 4 sides isn’t exactly the same you’ll need to keep repining and measuring until it is exact. The width around the middle between the rubber bands should be 1¾”. It seems simple to mark the top and bottom of an egg. But take the time to measure it and get it exact. 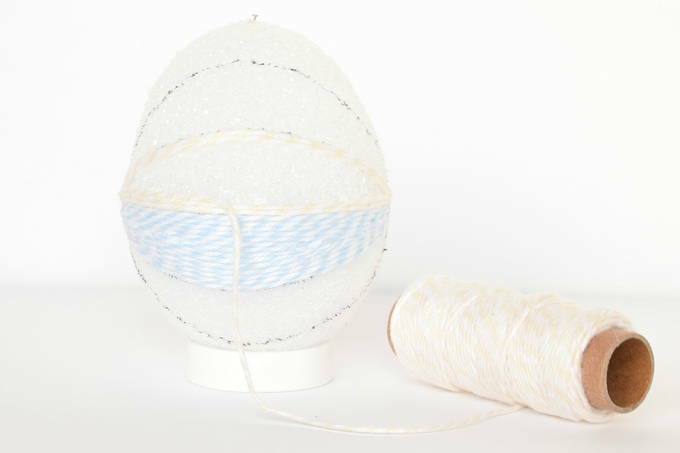 Let the marks on the egg dry first, before you start wrapping the twine. Take care to rub the glue off your fingers frequently to keep the egg clean. Cut a piece of paper ¼” x 4-2/16” to use as a mini ruler. Put marks on it that are 1-5/16 in from each end. Or put them at lengths you would like. 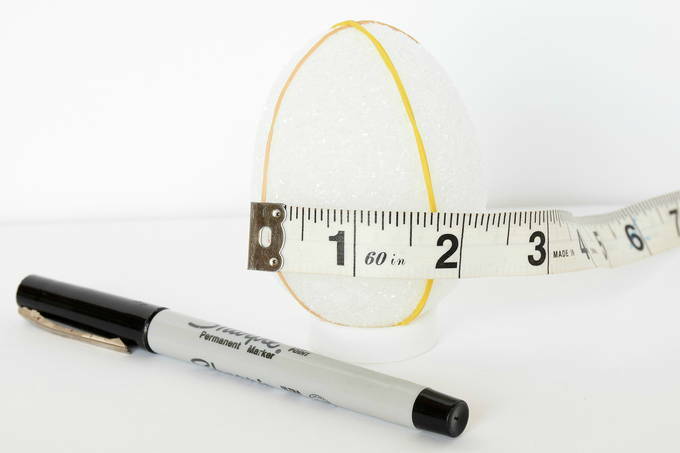 Lay the mini ruler from end to end on the egg touching each end pin. Put a pin at the marks on your ruler. Move your ruler over a little and line it up on the end pins again. Put pins where the marks are. Repeat this all the way around. 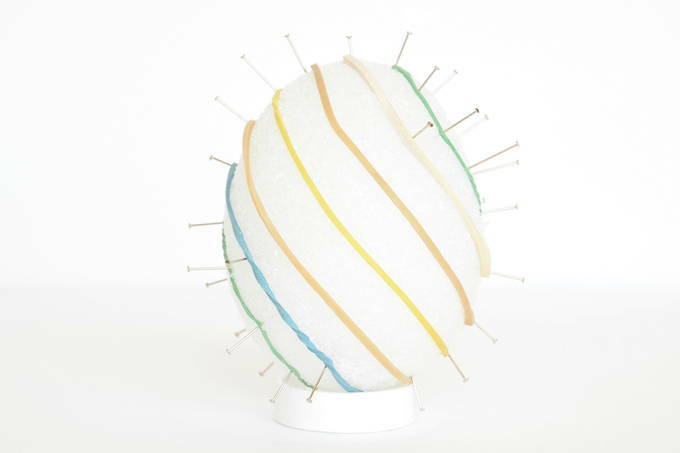 Wrap rubber bands around it on the pins and check that it looks correct. Then use the marker to draw a line along the rubber bands. 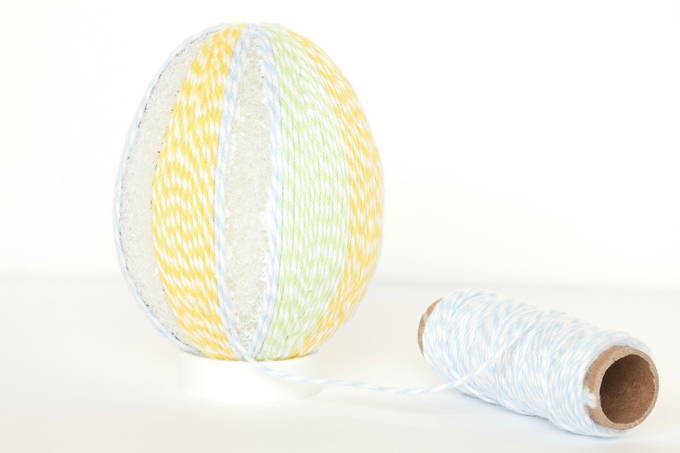 Glue the end of the first color of twine around the middle at the edge of its section. Put glue around where you’re going to wrap it. Then lay the twine down on the glue. Glue a little then wrap a little. Each new wrap around should touch the prior wrap. Be sure the coils are tight together when gluing over the marks from the marker. Pay attention to how level your wraps are. You don’t want them to start tipping downward and get uneven. Glue the upper and lower sections all the way to their ends. This photo shows looking down at the top of the egg. Mark the top and bottom of the egg. Wrap 6 rubber bands around it at equal distances. As you wrap, check that it crosses over the very top and bottom dots exactly. 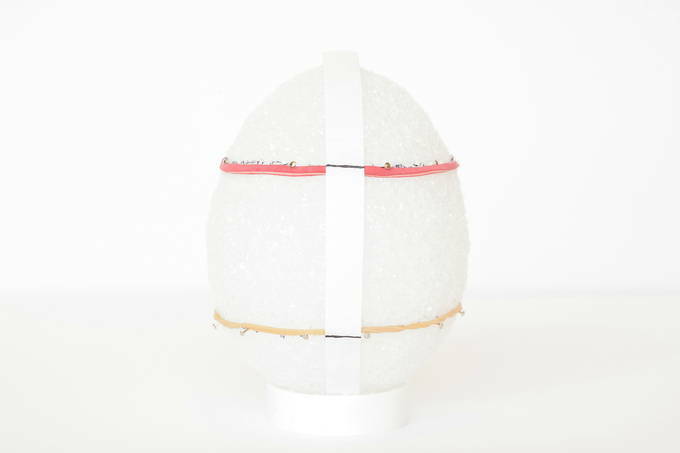 At the middle of the egg the distance between every rubber band should be about ½”. Once the rubber bands are at equal distances, mark the lines with a marker. Glue and wrap each individual section starting on the outside edge of the section and work your way toward the inside. I used my fingernail to press the twine down on the sharp turns. Glue all the way to the ends of the egg. 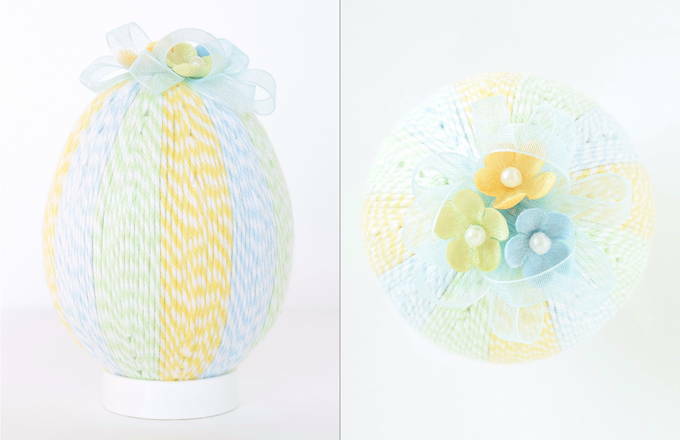 Use a more “free form” technique to mark the color divisions on this egg. 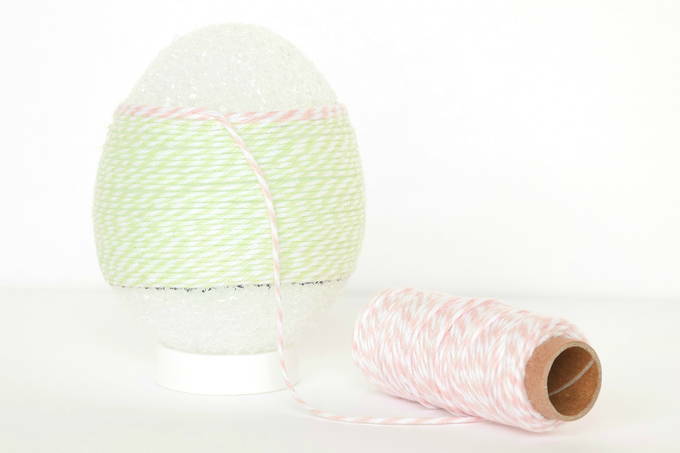 Wrap a rubber band around the egg at a diagonal. Then add more bands the same direction on both sides about ½” apart. Use the pins to keep the bands in the right spots. Use 7 rubber bands. Mark along the bands. 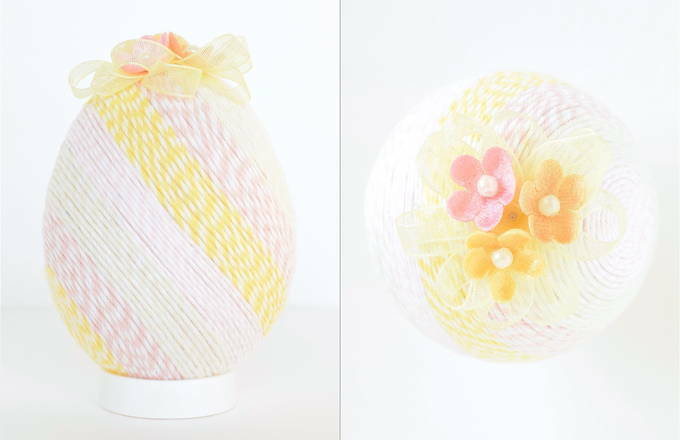 You’ll glue and wrap this one in the same way as you did the Marigold Egg. It wraps all the way around the egg. 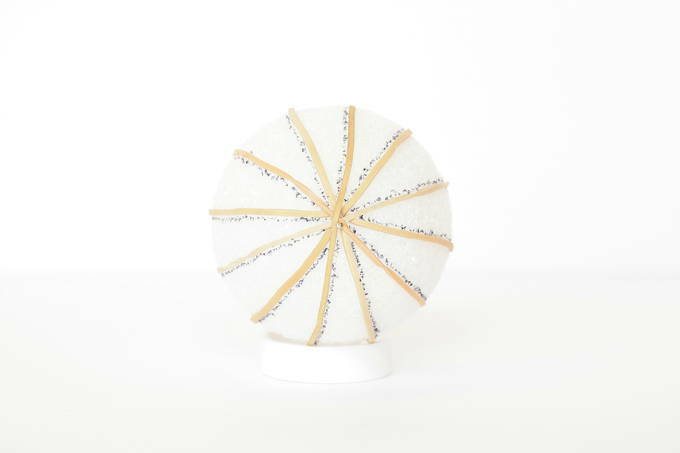 Except, the oval shaped sides are wrapped from the outside in like the Raindrop Egg. Just like you found the top and bottom now find the sides the same way. 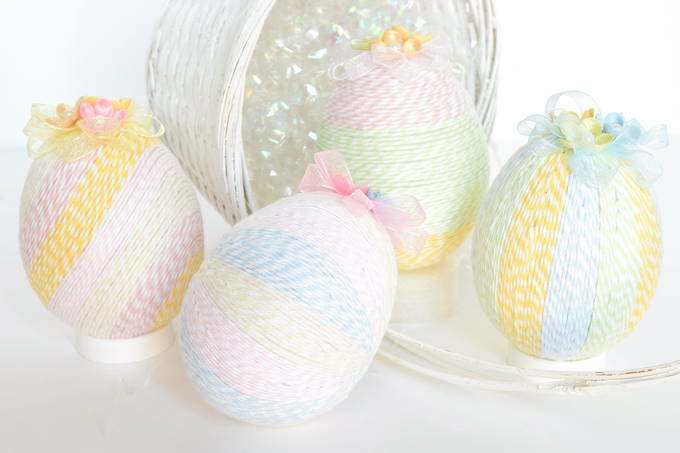 Put one rubber band around the egg vertically and one around the middle horizontally. The distance from the top to the side and from the bottom to the side should be 2”. Pin the bands in place around those x’s so they don’t move. Leave them sticking out some to hold where the bands cross in place. Add 4 more rubber bands that cross on those side x’s. Space them at equal distances apart. Mark along the bands. This egg is wrapped just like the Raindrop Egg. 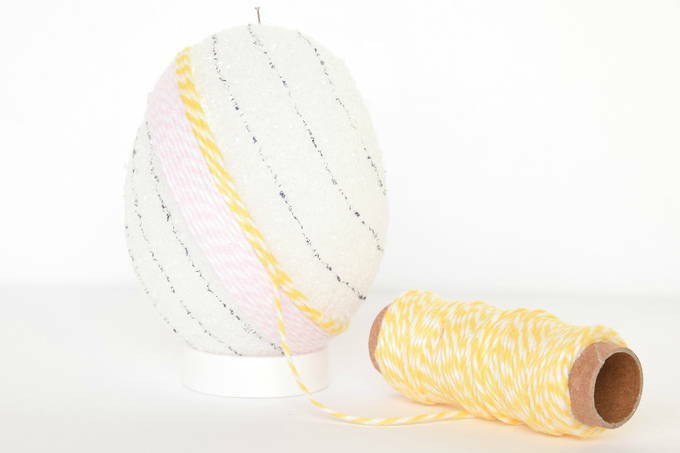 Start on the outside of a shape and wrap toward the center. Only you’re going around the side instead of up and down. Glue all the way to where the colors meet. No Styrofoam should show through. Put a pin up through a piece of ribbon ½” from the end. Make a loop 7/8” away from the pin. Make another loop just like that on the opposite side of the pin. Keep making loops and putting them through the pin until you have 3 on one side and 4 on the other. Then arrange the loops around the pin. Now make 3 more loops but they should be more pointy (like the kind of bow on a birthday present). They are just a tiny bit smaller than the other loops. When you’re done with the loops cut the ribbon so you have 3/8” of a tail. 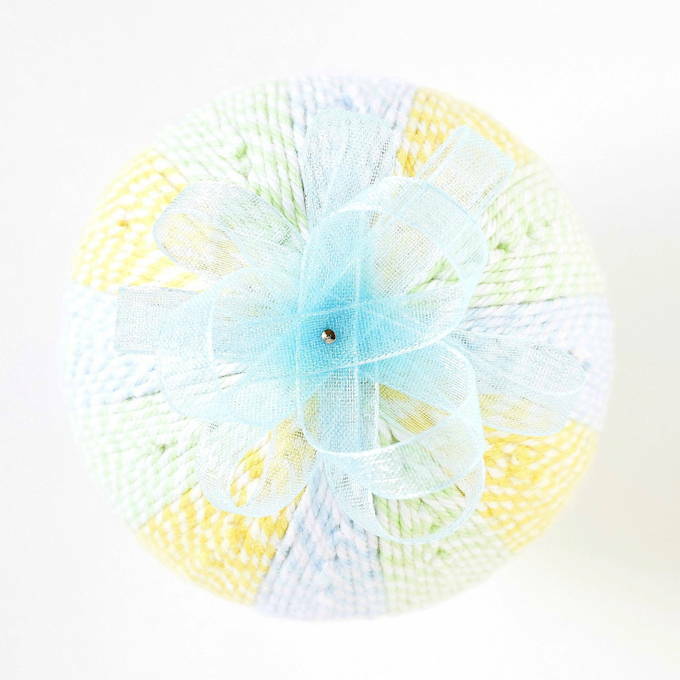 Put a pin down through the layers of ribbon from the top and remove the pin coming from the bottom. 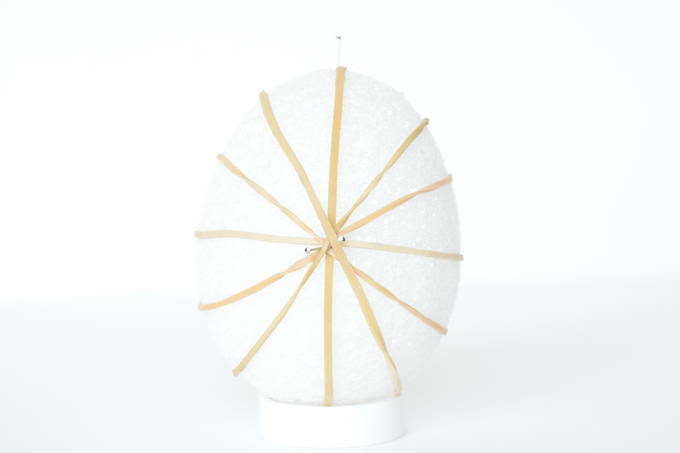 Put glue on it and stick it in the middle of the top of the egg. Wrap and glue the tail under in a tiny loop to cover the pin. Carefully remove the pearls from the flowers. 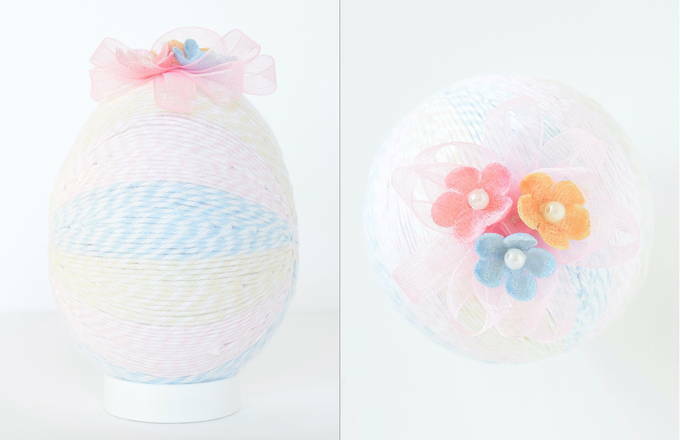 Put a pin through the center of three flowers and pin them to the top of the egg in the ribbon. 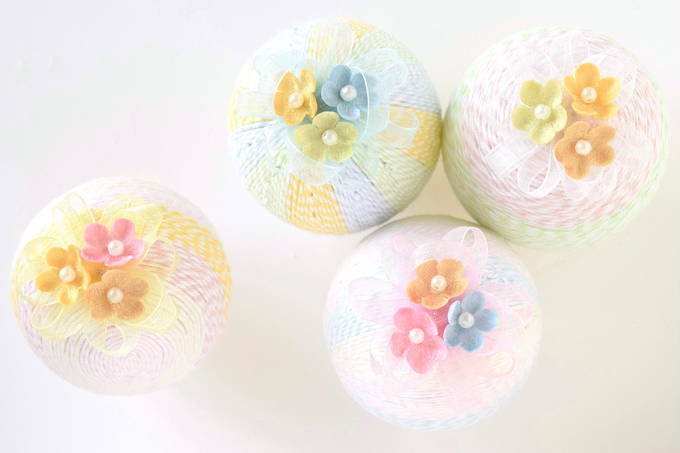 When you’re satisfied with how the flowers look, lift the pins up, put glue on them and stick them back in. Glue the pearls back on the flowers covering the pins.